A bunion is a “bump” on the outer edge of your big toe and forms when the bone or tissue at the big toe joint moves out of place. You may have a bunion if this area of your foot is red, swollen, or painful. Let's start with genetics first and your footwear next! 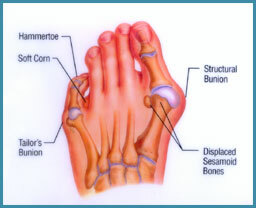 Bunions tend to run in families, specifically among those who have the foot type prone to developing a bunion. If you have flat feet, low arches, arthritis, or inflammatory joint disease, you can develop a bunion. Footwear choices play a role too! Wearing shoes that are too tight or cause the toes to be squeezed together, like many stylish peep-or pointed-toe shoes, aggravates a bunion-prone foot. If you’ve noticed the beginnings of a bunion, avoid high heels over two inches with tight toe-boxes. You can also use a bunion pad inside of your shoes to provide some protection. Who Can Help With my Bunion? Padding and taping to minimize pain and keep the foot in a normal position, reducing stress and pain. Physical therapy can relieve bunion pain, and ultrasound therapy is a technique for treating bunions and their associated soft tissue involvement. Orthotics or shoe inserts may be useful in controlling foot function to prevent worsening of a bunion. Surgery is an option too. Your podiatrist can offer several different surgical options depending on your unique situation.